Rosy’s salon inventory management software ensures that your shelves are always stocked. Gone are the days of missing profitable retail sales because of depleted inventory. Rosy will assist you in keeping your shelves stocked according to your own pre-set parameters while reducing inventory costs with inventory management software designed specifically for salons. Mass updates allow you to add all salon and spa inventory information at one time including manufacturers, product groups, product names, sizes, costs, and retail prices. Once you set the on-hand quantities, or current inventory, and target quantities, or what you want to keep on your shelves, you’re ready to roll. This system keeps continuous, accurate track of every product in your salon and adjusts the inventory figures each time you make a sale, process a return, or receive a new product shipment. 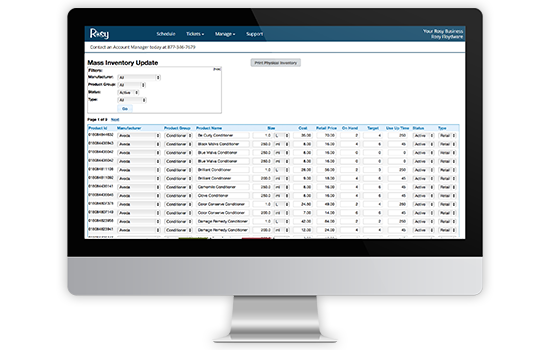 Rosy’s salon inventory software will also alert you when you’re running low on any product according to your own pre-set trigger points, without time-consuming physical inventories every week. You’ll save time, spot sales trends, simplify order processing, and maximize product sales – all while reducing inventory costs. Plus, powerful suggestive selling via the Salon Point of Sale automatically suggests product to customers based on their service needs.